Time to kick up your heels and say hello to the weekend! A new round of Designer Showcase has just begun. This month is filled with tons of gorgeous fashions and accessories. So let’s “step” into the weekend, shall we? And I have just the perfect shoe! KC Couture offers up the 40-color, fat pack of the Irina Heels. This high-heeled, strappy shoe is made for Slink High Mesh feet and for the following mesh bodies: Eve, Maitreya, Belleza and TMP. The included HUD offers customization of every part of the shoe including the straps, heel, sole and more. Choose between five metal finishes, five collar patterns and 40 colors. Price: 149L. Showing off these shoes are the Shoes Females Poses by Baxe. The poses are sold separately and as a fat pack. 10 poses in total. Price: 40L single poses and 200L fat pack. Designer Showcase runs through October 31. Your shoe game will always be tight when you’re stepping out in Hucci. Here are two of the latest releases and updates in footwear from this long-standing brand! The Maypearl Boots have been updated to now fit Slink Hourglass and Slink Physique V2. Fitted mesh standard size are also included. In addition to size/fit updates, the textures have been updated with four extra fashion colors. The Maypearl Boot collection is 895L, while each color is 295L. Did you previously buy this item? Never fear. 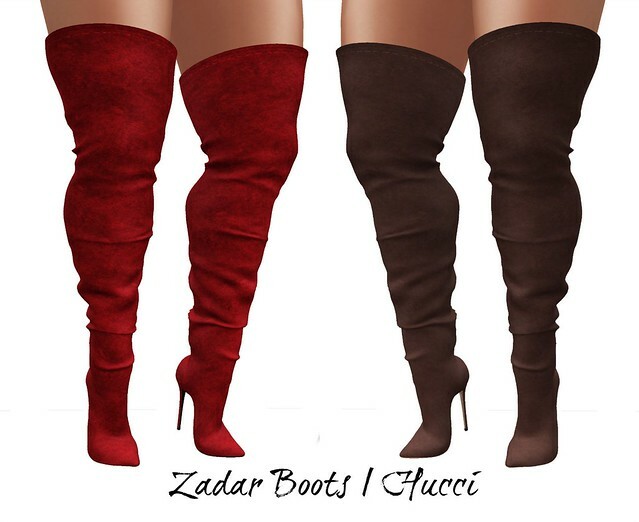 You can get them redelivered from the Hucci store and all these updates will be included. The current round of C88 is chock full of goodness and, as always, releases from Hucci are highly anticipated. Check out the Artesia Sandal, available in leather and suede. This sandal features fringe, chain and zipper detailing. Pure hawtness for your mesh feet! The Artesia Sandal is designed for Slink and Maitreya high mesh feet. Single colors are able to change between two metals and four soles. Collection packs (either leather or suede) are 588L while single colors are only 88L. dress – and i miss you by lavain & co.
Open toe, suede fringe booties. Two versions: Slink High Foot and TMP Ouch Foot. $88L each or all 11 colors for $788L.